The epidemic of obesity has grown dramatically in recent years, most notably in children, one-third of whom have been swept up by weight problems and are at risk for heart disease, diabetes, and certain forms of cancer, among other problems. Unfortunately, the battle against obesity is getting a lot harder. First of all, people trying to lose weight have been lied to. They have been told that the problem is a lack of exercise, when, in fact, studies clearly show that weight gain in the United States over the past 30 years is almost entirely due to changing eating habits, not a lack of physical activity. They have been lied to about food, with quick-fix, low-carb advocates pointing a finger of blame at bread and fruit, when carbohydrates actually have only four calories per gram, unlike fats, which have nine. That’s why people in Asian countries stayed thin and healthy until Western fast-food chains brought in meat, cheese, and other junk foods that displaced traditional rice-based meals. They have been lied to by some well-meaning, but not-yet-well-informed fat-acceptance advocates who, while helpfully rallying against discrimination, have also sought to minimize obesity’s dangers with phrases like “obese but healthy.” You can also be “a smoker, but healthy,” but that simply means the complications have not yet arrived. But most of all, they have been lied to by the meat and dairy industries, which aim to convince us that we need cheese, meat, and other unhealthful foods. The federal government, traditionally beholden to industry, has joined in the duplicity, not only by subsidizing the very foods that cause weight gain and by dumping them into our children’s school lunch programs, but by issuing dietary guidelines that have been too timid to chuck unhealthful foods out. As a result of this lack of forthrightness, obesity has settled in for the long term, and many people have simply become resigned to it for themselves and their children. The consequences will be devastating: Experts estimate that one in three children born in 2000 will go on to develop diabetes—a disease strongly linked to excess weight. The obesity epidemic is not caused by inactivity, bread, rice, gluttony, weak will, or a bad childhood. It is caused by a tsunami of unhealthful foods, and one of the worst, perhaps surprisingly, is cheese. Typical cheeses are about 70 percent fat, and every last fat gram packs nine calories that no one needs. Most of that fat is saturated (“bad”) fat—the kind that increases cholesterol levels and puts us at risk for diabetes, Alzheimer’s disease, and other diseases. A 2-ounce cheese serving also packs 350 milligrams of sodium and, ounce for ounce, as much cholesterol as a heart-stopping steak. 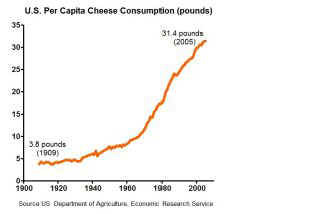 In 1909, the average American consumed only 3.8 pounds of cheese in a year’s time. Today, that number is pushing 34 pounds. That’s an increase of 30 pounds per person this year, next year, and again the year after that, thanks to the combined promotional efforts of government and industry. Of those extra 30 pounds of cheese we are stuffing into our mouths every year, it would only take one or two to stick in order to explain the entire weight problem in America. Of course, there are other co-conspirators in the obesity epidemic, too, notably the rise in meat and sugar consumption. PCRM erected billboards in New York State depicting a heavy-set man and woman and pointing out, clearly and simply, that cheese contributes to obesity. Judging by the press response, it was a message that was badly needed. Many reporters had no idea that cheese was so high in fat and calories. We knew that the dairy industry would object. But the fact is, dairy farmers and their families need this message, too. After all, they run the same risks as their customers. Some overweight people may object, too. Just as cancer organizations have used images of tobacco-damaged lungs and anti-drunk-driving organizations have shown grim accident scenes, graphic visual reminders are painful for the victims of these conditions. Certainly, there is no value in blaming overweight people for a condition that results from a mixture of industry marketing, government promotions, addictive qualities of foods, genetic vulnerabilities, medication effects on appetite, and, in the end, overeating. Instead, it is essential to zero in on the problem foods, expose them, and do what we can to get them off our collective plates. The PCRM billboards are a mirror, showing obesity as it really is, linking it appropriately to cheese, and making it clear that there is a problem here. The worst thing that doctors or the public can do is to slow down the fight against obesity and against the foods that contribute to it. Prying a generation away from tobacco was tough, and prying people away from obesogenic foods today will be far more challenging. People struggling with weight problems deserve understanding and support, and we do them no favors if we hide the problem, sugar-coat it, or fail to address its causes. We have to face the dangers of obesity directly, make it clear that certain foods are serious problems, and do all we can to support the changes that are essential for good health.